A federal Liberal candidate says he was kicked out of an armoury by military officials in Nova Scotia, who he claims told him his presence at the crumbling heritage site was in violation of the Elections Act. A federal Liberal candidate is accusing Ottawa of interfering with his campaign by allegedly kicking him out of an armoury in Nova Scotia as he tried to tour the crumbling military facility with several older veterans and the media. 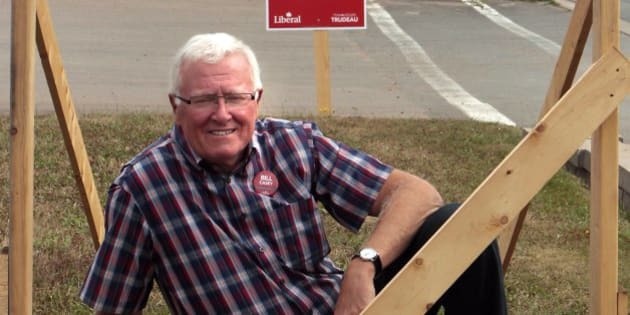 Bill Casey, who's running in the riding of Cumberland-Colchester, said Tuesday that he and the former service members were visiting the Col. James Layton Ralston Armoury in Amherst last week when a military spokesman told him to leave because he was in contravention of the Canada Elections Act and "he knew it." Casey said he challenged military spokesman Mike Bonin on the specific clause in the act that would prevent him from campaigning there, only to have Bonin later clarify that it wasn't a violation of the act, but that he was taking direction from the Privy Council Office. The Department of National Defence said in a statement that during an election campaign, defence establishments are not to be used for campaigning purposes as the department and the Canadian Armed Forces must be seen to be neutral. Bonin refused to comment Tuesday, saying he was "implicated in the matter" and had been advised not to speak. He would not say who advised him. Raymond Rivet, communications director for the PCO, said in an email that "there was no direction from PCO regarding access to the Amherst Armoury." Casey said he has filed a complaint with the Chief Electoral Officer and asked him to investigate. "I think they didn't want anyone in there to take pictures of the situation or to make it public," Casey said, adding that the building has sections blocked off due to concerns over its integrity. "And the fact there's no disabled access — just think about it, the veterans who brought back artifacts from Afghanistan and the Second World War now can't access them." Francoise Enguehard, a spokeswoman for Elections Canada, could not confirm if a complaint had been filed but cited Section 81.1 of the act. It states that a candidate cannot be prevented from campaigning at a building during business hours unless it is "incompatible with the function and purpose of the place or inconsistent with public safety." Casey, a former Tory MP who was expelled from Prime Minister Stephen Harper's Conservative caucus in 2007, said he wanted to highlight the poor state of the armoury and press Ottawa to follow through on promises to repair it. He said parts of the armoury, which was built during the First World War and now houses a museum, are plastered with more than a dozen signs warning of falling debris and areas that may collapse. Casey said he sent out a press release last Monday outlining his plan to visit the armoury the following day. He said Defence left him a message at his constituency office saying he was not allowed on DND property during the writ period. When he arrived last Tuesday, he says he was told to leave, not take any photos and speak to Bonin who was on the phone from Halifax. "They have no business at all being involved with this," Casey said of the PCO.